It’s purple. And there’s a camera at the bottom, such as Jessica Jones uses. Let’s guess that with Jessica Jones being one of the best of the Marvel television series no matter the network, the character couldn’t go without a book very long, even though her creator Brian Michael Bendis has gone on to Kryptonian pastures. This mysterious teaser Marvel just dropped might be the hint that she’ll be coming back soon… and still struggling with Kilgrave, the Purple Man. 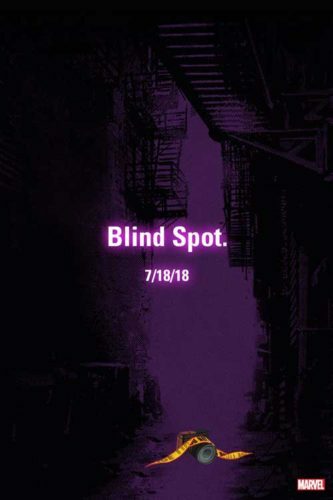 At least, I’m pretty sure Marvel isn’t adapting the TV series Blindspot to comics. Marvel has this image dated tomorrow, so I’m guessing there’s a big surprise coming just in time for Preview Night at Comic-Con.